Lisa Schroeder, Author: A new book - YAY!! The announcement requires at least one side note. First, it's not YA, as you can probably tell from the description. It's very much middle-grade. Also, the title will probably change. And okay, one more note, it's a book that's really hard to explain, and has so much more to it than that little description. Like hummingbirds. Yes! Hummingbirds!!! I'm so excited about the birds, I can't even tell you! Events happen in and around a garden - a beautiful flower garden. There is a girl and a boy. 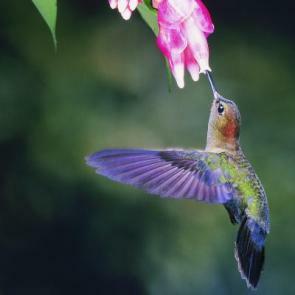 How can a small hummingbird help a girl and a boy? I had turned to this page many times before. When I did, I would look at the words I'd written, ponder them for a minute, and quickly move on when nothing came to me. But not this day. This day, I looked at the page in my journal and said to myself, "I want to write THIS story. I just have to figure out what this story is." So I did what I don't allow myself to do very often. I sat and stared out the window for a long time, turning it all over in my mind. And what came to me was, what if a girl is trapped in a tower next to a beautiful flower garden? That's how it began. It turned into something different, something more, as books usually do when you start with a small seed. Some of those original ideas changed like, although there is a king, the queen actually plays a bigger role. And rather than having a boy and a girl, there is just a girl. And there are other characters I won't bore you with who are important to the story too. I had so much fun with this story! I checked out all kinds of books about castles, and every day the story swept me up and away to a distant land and I LOVED every minute of it. My friend Lisa Albert critiqued the manuscript, and I want to thank her for giving me the encouragement I needed, and also giving me an idea that made the ending SO much better! It's scary, trying something new and branching out. But as I told someone recently, as an artist, there are times when the pull to create a specific something planted in your heart is so strong, there is almost no stopping it. And once I started writing, so was the case with this book. I don't have a publication date yet. I believe Christy hopes to find a fabulous illustrator for it, and there may be black and white sketches throughout. If so, that will, of course, take time. Anyway... that's how the book came to be in a nutshell. Or perhaps, a hummingbird's beak? YAY!! Congratulations! I can't wait to read it. How exciting! This story (and post) feel magical. I can't wait to read it and see cool illustrations. Awesome! It sound sgreta! Congrats!! Congratulations. It sounds like a lovely little book. This sounds so fun. Congrats again, Lisa! Congratulations!!! I'm so excited about this book! It just sounds marvelous!!! Love that page in your journal. Oh, to have a page that full of ideas! YAY, Lisa!!! How exciting! And love me some more MG!!! Congratulations!!! CONGRATULATIONS!! So excited to read this one! And thank you for the lovely 'behind the page' post. This story is amazing! Congratulations! Congratulations! I can't wait to read it. Can you please post an update whenever there's more news about it? This sounds absolutely wonderful! Congratulations! This sounds really interesting and a great adventure story!